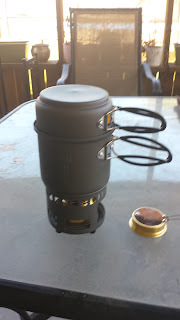 My Esbit 5 piece camp stove arrived. I washed it, filled it with fuel and boiled some water. I was a bit surprised how fast it went through fuel, but it boiled water just fine, and cooled down quickly afterwards. 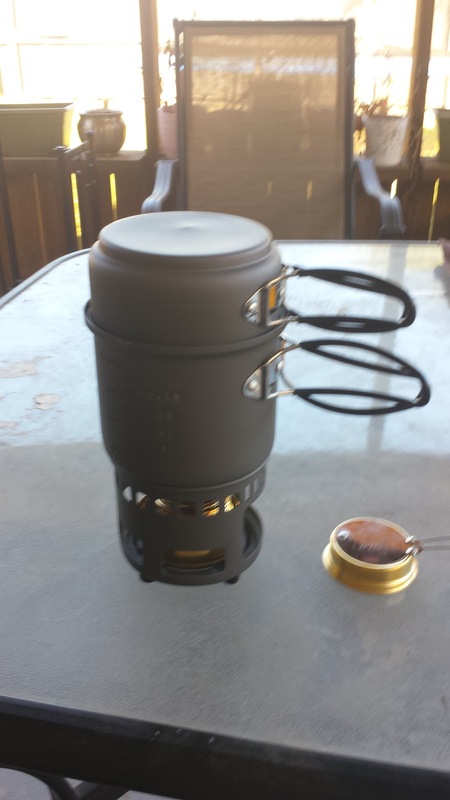 I filled it up and fired it up a second time to make some instant mashed potatoes and some tea, which it did a fine job of. We'll see how I use it on the upcoming trip. I was thinking I might pop some green beans and some cheese in a Ziploc bag, and mix that in with the potatoes. Sounds decent for dinner, yeah? Oatmeal and tea for breakfast? I can see that I might have to learn a few new recipes. The new front rack has arrived.